ne of our primary barriers in this society to total freedom is economics. 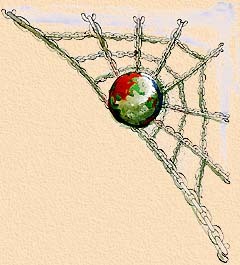 Suppressives have been weaving a web of economic entanglement for societies for some time, using economic misinterpretations or ignorance to involve those societies which only recently struck off their chains of actual slavery. Today, the chains are made of economic restrictions and, to be blunt, economic lies. An understanding of economics is a bold step forward toward total freedom in a society. Aberrations tend to blow when their lies are exposed. Therefore I have written this short essay on the actual laws of economics, as they may help you on your way to freedom. Today, almost any person has a present time problem, growing more pressing as time goes on and as our society evolves. Economics are as simple as they are not obscured and as confused as they are made to serve a selfish purpose. Any child can understand—and practice—the basic principles of economics. But grown men, huge with the stature of government or chain banks, find it very useful to obscure the subject beyond all comprehension. The things that are done in the name of “economic necessity” would shame Satan. For they are done by the selfish few to deny the many. Economics easily evolve into the science of making people miserable. Nine-tenths of life are economic. The remaining one-tenth is social-political. If there is this fruitful source of suppression loose upon the world and if it makes people unhappy, then it is a legitimate field for comment in Scientology as it must form a large “misunderstood” in our daily lives. Let us see how involved it can be made. If mankind increases in number and if property and goods increase, then money must also increase unless we are to arrive at a point where none can buy. Yet money is pegged to a metal of which there is just so much and no more—gold. So, if man’s expansion is to be checked, it will be checked simply by running out of this metal. And aside from art uses and superstition, the metal—gold—has almost no practical value. Iron is far more useful but as it is one of the most common elements about, it would not serve the purpose of suppression of man’s growth. MONEY IS SIMPLY A SYMBOL THAT PEOPLE ARE CONFIDENT CAN BE CONVERTED INTO GOODS. The most virulent philosophy of the 19th century was not that of Dewey* or Schopenhauer. * It was that of a fellow named Karl Marx, a German. In his book, Das Kapital, he set out to destroy the world of capitalism by introducing the philosophy of communism, borrowed in some part evidently from the leader Lycurgus, of the ancient Greek state of Sparta.